If you are a fan of all-natural décor and accessories, you are going to love our pure beeswax candles. Unlike most decorative candles, our candles are homemade from scratch and are not made from bleached wax! We remove fresh yellow cappings from honeycomb as a part of the natural extraction process and pour them into candle molds. Optional essential oils create a delicate warming fragrance that will leave a subtle and comforting aroma in your home, unlike artificial scents that are made with chemicals and paraffin. Candles are sold individually and stand at 6" tall. 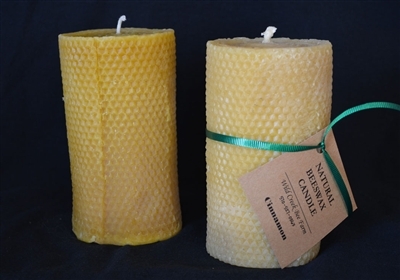 Our rolled beeswax candles also create a cleansing effect, as the beeswax is known to help remove odors from the air and even reduce irritating dust and allergens in the home. Since our candles are made with 100% natural materials, you may see a white residue on your beeswax candle. Do not worry – this is just bloom! This is the result of natural components of the beeswax coming to the surface of the candle, and can easily be wiped away with a lint free cloth. We care about each of our customers, and want to remind you to never leave a burning candle unattended! Place your pure beeswax candles on a dish in the event that wax drips off the candle.